I naively thought since Morocco is in the Motherland, I was going to enjoy almost tropical weather. I checked the weather forecast and predicted January temperatures were only slightly higher than London's. Awks. 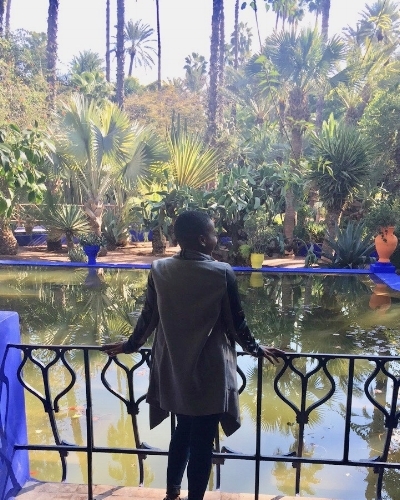 * Once I got over my disappointment, I geared up for a great time in Marrakech and it did not fail to deliver. In this post I combine my research with recommendations from Marrakech aficionados in my circle to give you a good starting point for planning your own fun times time in Marrakech. Yay! Where in the world is Morocco? National Dish: Tagine - A meal comprised of a protein base (beef, chicken, rabbit, etc) stacked with potatoes and local vegetables. It is cooked in a clay "oven" that goes by the same name. I recommend staying somewhere close to Djemaa el-Fna, the popular square and market place in Marrakech's medina. This is the heart of the city and where all the action is, so if you'd rather some peace and quiet, you might be better off staying in areas which are further out, such as Hivernage or Gueliz. I stayed at Savoy Le Grand Hotel which is a 30min walk away from the square, but only an 8min drive from it. It's a beautiful hotel with lovely grounds, an on-site spa and a variety of room options. The things that stood out to me about it were its extremely hospitable staff, how yummy the lobby smelled, and how the tea pourers never got tired of putting on a tea pouring show on demand, so I could record them doing it. One of my trip highlights, to be honest. FL Tip: Consider staying in a riad (a traditional house with an interior garden or courtyard as its central element) instead of a hotel for a more culturally enriching experience. Riad Al Moussika and Riad Jardin Secret are both well priced options located 10min and 18min away from the square respectively. Riad Lamrani : This plush riad has 6 rooms and is located in a very safe neighborhood which is only an 8min walk from Djemaa el-Fna. Great option for solo travellers. Resorts like Es Saadi or JNane Tamsna fully decked out with restaurants, bars, a casino, activities and pools. And if you're really looking to spoil yourself, the Royal Mansour may just be the perfect option for you. 1. Visit Djemaa el-Fna: This is where the magic happens, literally. During the day it starts out as a fairly quiet space with snake charmers and medicine men. In the early evening it begins to get filled up with storytellers, acrobats, fortune tellers and a lot more visitors. 2. Wander through the Souks (marketplace in the medina just north of Djemaa el-Fna) and spend your dirhams! If you're anything like me, you might get lost while your phone is dead and panic a little, but it's all a part of the adventure. FL Tip: Visit the Souks early morning (~8am) or late afternoon (~430pm) to get a chance to take a more detailed look at the beautifully detailed decor on the doorways and arches. Visiting later in the day also gives you more bargaining power. 3. Visit Jardin Majorelle: The pretty garden bought by Yves Saint Laurent and Pierre Bergé in 1980 when it was set to be converted to a hotel complex. I've seen so many photos of other travellers with the exact backdrop online! Do you recognise it? Selfie at Galerie Love, an exhibition of posters that Yves sent as New Year's greetings to his friends and clients. 4. Visit other city highlights such as the stunning Bahia Palace - built for a former slave who became the favourite of the Sultan at the time, the Koutoubia Mosque, and the Saadian Tombs - the resting place of Ahmed el Mansour, the 5th and final ruler of the Saadi dynasty. FL Tip: The hop on, hop off bus is a good way of exploring these attractions yourself or alternatively get a private guided tour. There are lots of options on Trip Advisor or Viator, with half day tours starting from £13. 5. Take a tour of La Palmeraie, the palm grove of Marrakech on a camel, quad bike or both. 6. Get an adrenaline rush at Waky Marrakech: Offers an insane amount of water sports, and a bar with music, food and drinks if you need a break or if water sports aren't really your thing. 7. Go hiking on the Atlas Mountains. 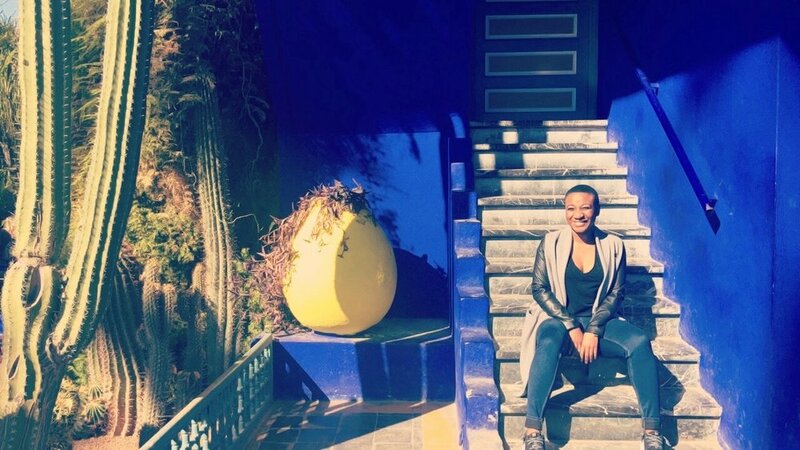 If you're not about that hiking life, explore the region's valleys and plateau towns such as Ouarzazate, known as the Hollywood of Morocco in certain circles. The tour I did also included a visit to a Berber village. 8. Pamper yourself with a relaxing hammam. I went to Le Bains D'Orient and got scrubbed so hard, it was like all my sins were washed away. I felt so good after! *Dinner time in Morocco tends to be fairly late, around 9pm - 10pm and you might find that restaurants and bars are kind of quiet before then. No fit fam for you, sorry. Open at 10am. Interesting indoor and outdoor dining spaces with very cool decor. Also offer private lounges for groups. Open at 1130am. Serve more typical dishes like steaks, burgers, fries and tapas, if you're in not in the mood to experiment. Al Fassia - Restaurant - Moroccan Cuisine. This is actually where we went here for the "official" birthday dinner, food was really good! This place is so romantic and is perfect for date night. Dinner only. Entertainment is provided by Gnawa musicians. Trendy venue. Typically doesn't offer entertainment or live shows, but has a nice ambience. Serves brunch, and has a live show at night. Sometimes have a show with belly dancers. Arabian Nights themed venue with entertainment including belly dancers, fire breathers, music, etc. Although Morocco is considered liberal compared to other predominantly Muslim countries, it has a number of penal codes which deter Moroccans from converting to other belief systems from Islam. As a result, Moroccan Christians have gathered behind closed doors in the past and and have only recently (April 2017) started campaigning for their rights to practice their faith openly. If the little I've read on this topic is correct, then only expats and international visitors are allowed to attend church. Such a good reminder not to take my rights and freedoms for granted. Anyway as you can imagine my list of recommendations for churches in Marrakech is quite short. Marrakech Church meets on Sundays at 6pm (yay for sleeping in!). I personally haven't visited so I can't say for sure what the doctrine is, but the website doesn't ring any alarm bells to me. If you've been, please let me know what your experience was like! Honestly, putting this post together got me all warm and fuzzy on the inside. I'd love to go back to Morocco (ideally when its warmer) and take some time out to explore the northern cities like Tangier and Fez. Have you been to Morocco? What was your favourite thing about the trip? Is there anything you'd change? *Just spent 5 minutes looking up the etymology of the word "awks". The internet is such an interesting place.